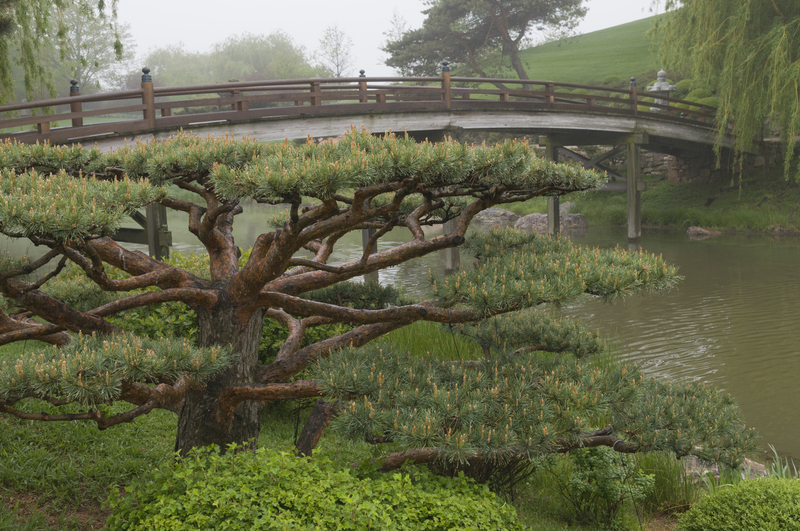 Mike is an assistant horticulturist at the Chicago Botanic Garden, who typically can be found around the Plant Conservation Science Center Green Roof or in the Elizabeth Hubert Malott Japanese Garden. He graduated from the University of Illinois with a bachelor's degree in horticulture science in 2012. Aside from growing plants, he enjoys reading scientific papers, breeding plants, visiting museums, and traveling. You’re in a small suburban downtown in early autumn. The sun hangs low in the twilight sky. The crisp, cold air carries the rich perfume of straw, touched with pumpkin spice and apples.You pull your arms close to your body and cradle a warm drink between your hands. Polyester witches hover over pumpkin-laden lamp posts. Planters overflow with chrysanthemums in assorted colors of bronze, gold, white, and red. Chrysanthemums, also called “mums” or “chrysanths” have always felt to me like old American flowers. This was the kind of plant that grandmothers flocked to the nursery for, just before the leaves began to turn, as if there were some prehistoric trigger deep in the mind. 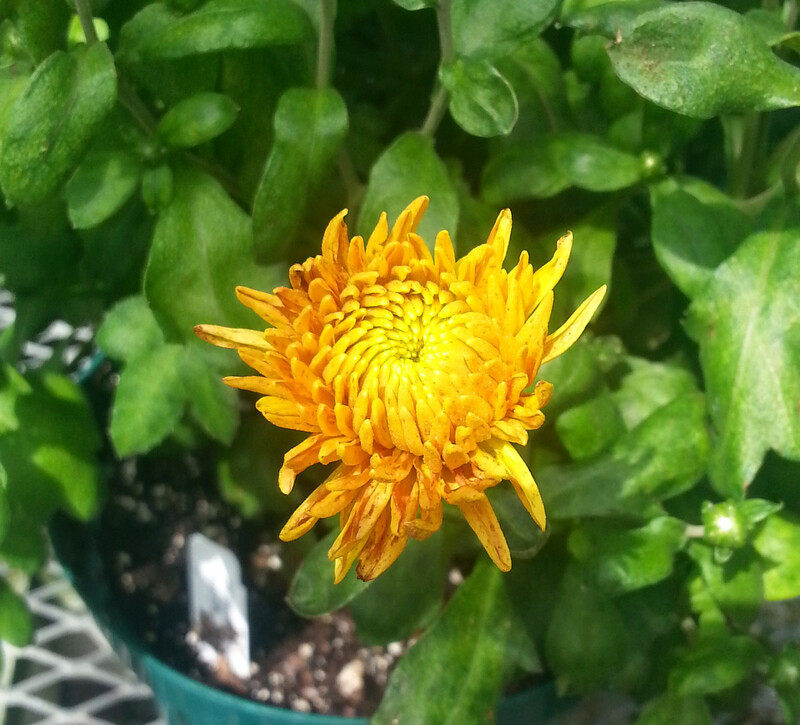 As traditionally American as they may seem, the chrysanthemum is actually a Chinese immigrant. Modern varieties of mums are much improved, but some of the original Chinese versions could have had flowers like these. Cultivated as an herb in China for more than 3,500 years, the chrysanthemum represents nobility and is considered one of the four gentlemen: the pure and defiant recluse that represents fall. For a long time, the flowers were only permitted to be grown by nobility, later becoming the badge for the old Chinese army. Chrysanthemum seeds passed through Korea and arrived in Japan sometime around the fourth century. In 910 C.E., Japan held its first Imperial Chrysanthemum Show and soon after, this became the national flower and the imperial seal of Japan, or “mon” of the imperial family. At the Festival of Happiness and Nihonmatsu Chrysanthemum Dolls Exhibition celebrations in Japan, plants are sculpted to cascade, form trees, and even form outfits for life-sized dolls. In 1688, chrysanthemums crept into Europe. The reception was not warm. It wasn’t until 1843 when Robert Fortune, funded by the Royal Horticultural Society, set out in search of hardy chrysanthemums from China. Within a few years, the plant experienced a popularity boom, especially in France. In contemporary Europe, countries such as France, Poland, and Spain regard certain types of chrysanthemum as a symbol of death and mourning. It is a cultural taboo in some of these areas to provide them as a gift. Though chrysanthemums arrived in the United States more than 100 years after their arrival in Europe, their popularity exploded at about the same time. In 1900, the Chrysanthemum Society of America formed and the first exhibition appeared at the Art Institute of Chicago in November of 1902. It has since become a fall classic in America. The very first mums to be classified were yellow to gold in color (the name comes from the greek words “khrusos” for gold and “anthemon” for flower). Thirteen classes of chrysanthemum in nearly every color (except blue and black) make up the thousands of chrysanthemums that have been bred over the years. Chrysanthemums are classified as irregular incurve, reflex, regular incurve, decorative, intermediate incurve, pompon, single and semi-double, anemone, spoon, quill, spider, brush or thistle, and unclassified or exotic. For a full list with descriptions and pictures, visit www.mums.org/chrysanthemum-classes/. 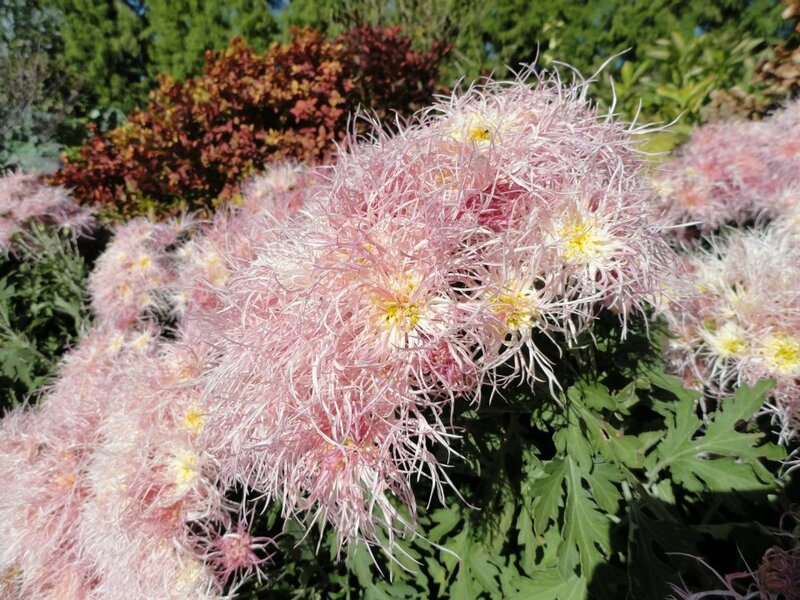 Chrysanthemum ‘Wisp of Pink’ is a stunning brush mum. Photo by Tom Weaver. 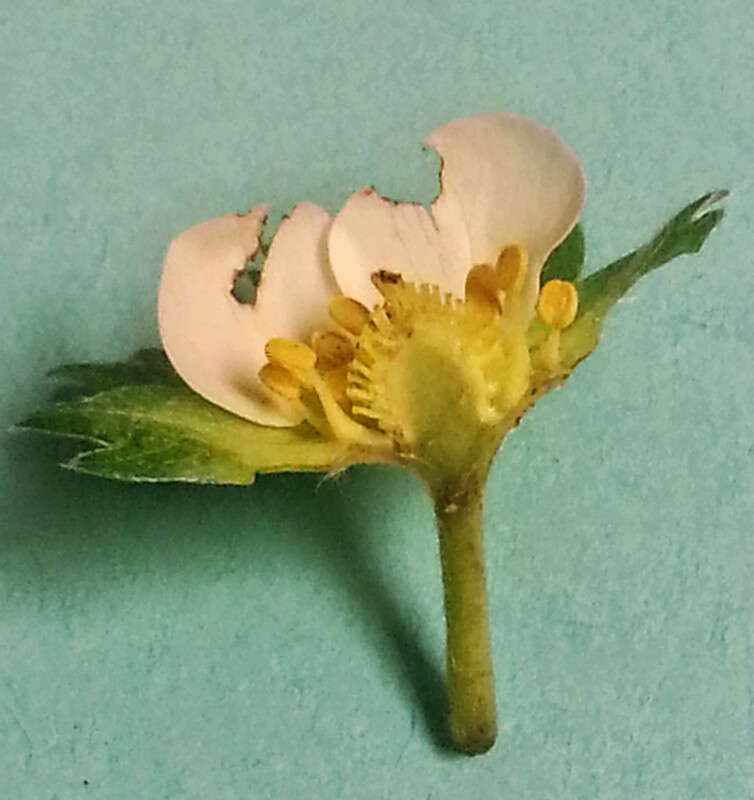 As gardeners know, the emergence of flower buds is an exciting event. At the Garden, we drum up the same excitement by using dark cloth to omit light and simulate short day conditions, which triggers the flowering of chrysanthemums. If the summer is typical and you time it right, you will have flowers right when you want them. With an atypically cool summer this year, they received just the encouragement they needed to flower early. That means that if you’ve been to the Garden in the past few days you’ve likely seen the more than 1,600 mums that we planted in the Crescent and the cascading mums descending from the hayracks over the visitor center bridge! This year, our wonderful production staff grew 50 cultivars of mums, starting in February, to produce more than 12,000 mums for fall displays! Tim Pollak, outdoor floriculturist, oversees the growing, training, and care of the mums from February until they enter the gardens in September. Did you ever wonder how we get our mums to look the way they do? 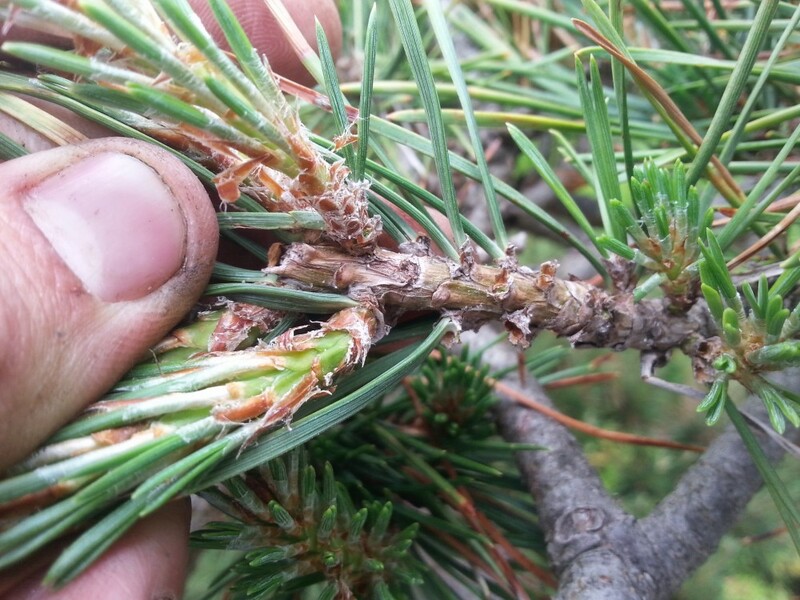 Good watering practices, fertilizer, disease management, pinching and…nuts? 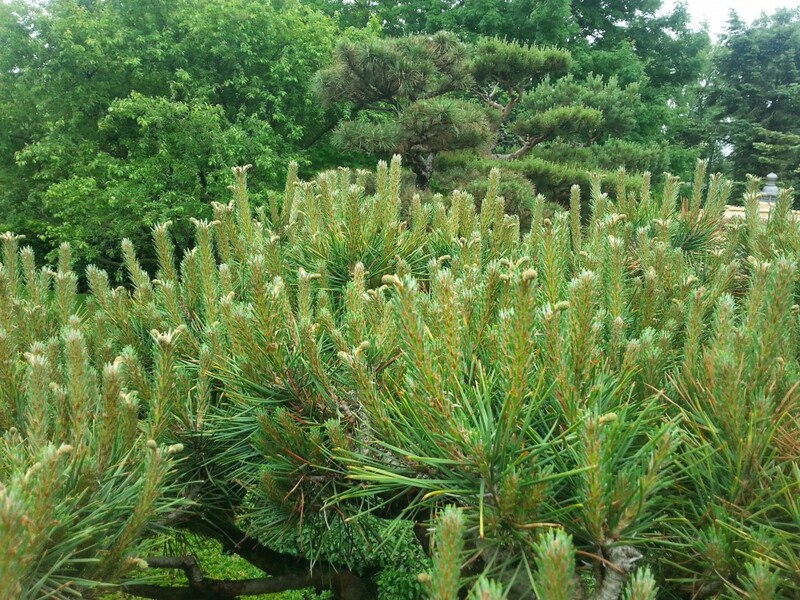 Hex nuts hang off chrysanthemum branches like ornaments on a Christmas tree. 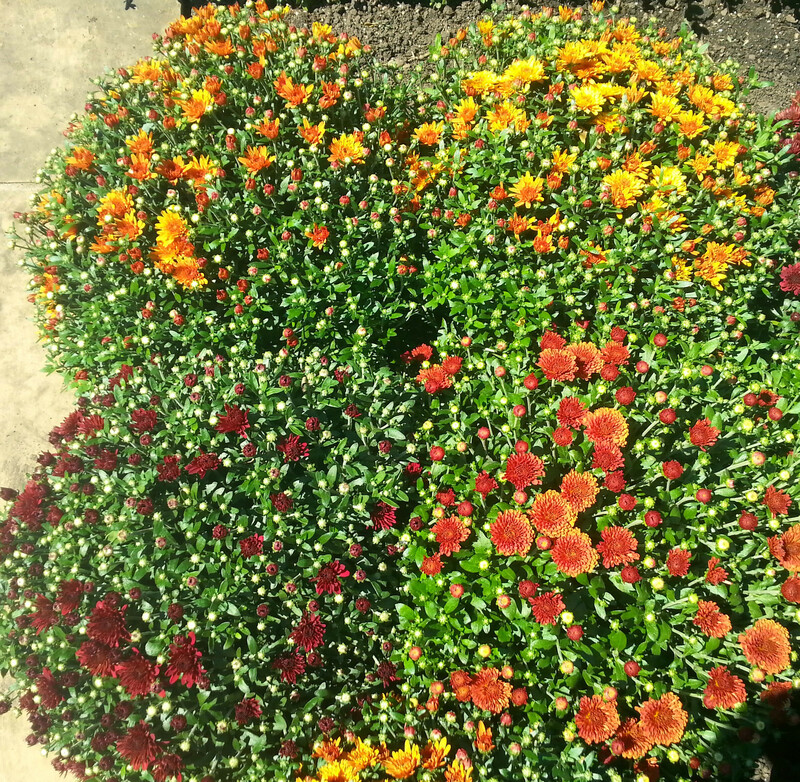 This year there are four different mums planted in The Crescent. 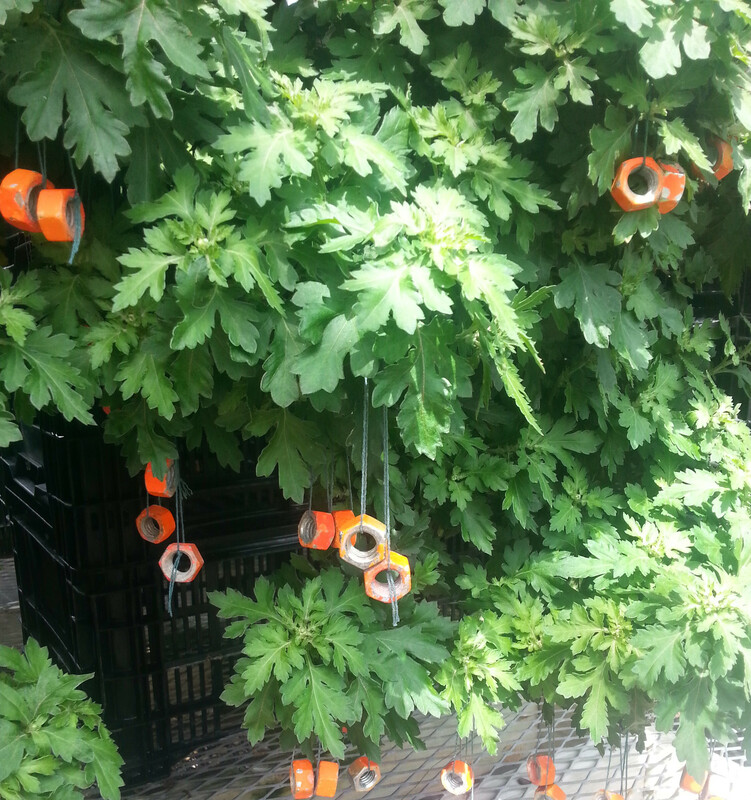 To train our cascading mums, we attach hex nuts that act as weights to hold down the stems as they grow and harden. This is done weekly by two staff members from February until late August, amounting to more than 400 person-hours from this activity alone! The mum ball containers you’ll find in the Crescent are the result of the four other techniques used to make our mums look good. Each container contains 18 to 60 plants that are pinched twice a year to obtain those enormous colorful balls! When you visit, make sure to visit the Elizabeth Hubert Malott Japanese Garden to see the cascading mums, a tradition that has endured for more than twenty-five years! Also, keep an eye out for mums in the Circle, Sensory, and English Walled Gardens, as well as a new fall feature in the Heritage Garden. Fall planted mums rarely survive winter because their root systems aren’t well developed. Start with healthy, hardy mums in spring, after danger of frost has passed. Plant them somewhere that they’ll get at least three hours of sun. If you want bushier mums, pinch once in early June and later in mid-July. The later you pinch mums, the later they flower, so if you have a cool summer and want later mums, give an extra pinch in the beginning to middle of August. If you wish to fertilize, one to three times throughout the season will be enough for most mums. As for which mum to plant? Tim Pollak suggests the Igloo series. If you ever find yourself grumbling over the dandelions that make their home in your lawn, or staring angrily at the purslane popping up in your vegetable garden, I have a suggestion for you: make a salad. You may be familiar with the concept of foraging for weeds. I first became interested in the subject in college, when I realized that free food was everywhere once you knew where to look. (The reality soon set in that most of this “free” food was actually growing on lawns and private property.) Whenever you forage weeds and wild plants you have to be careful that what you take isn’t getting sprayed with herbicides—which is why I recommend only harvesting weeds from your own yard, or places you know have uncontaminated soil (and aren’t sprayed). It’s also very important to know exactly what you’re eating. 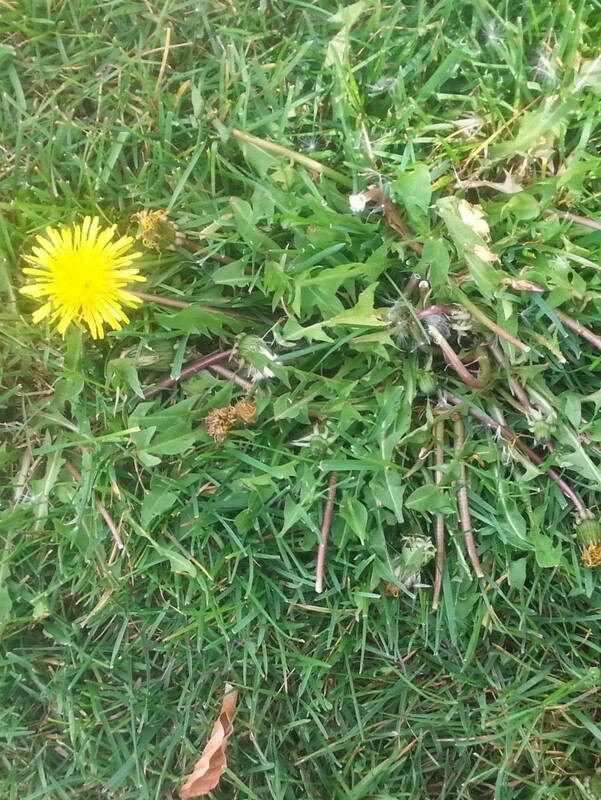 Sometimes weeds have look-alikes that can be upsetting to the stomach or downright deadly. 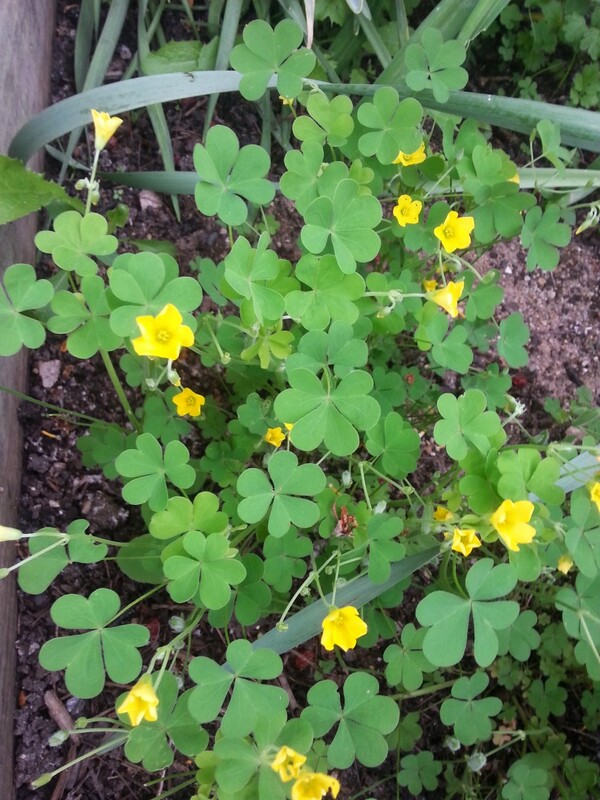 Others, of course, you can easily recognize from a distance, like yellow wood sorrel. Great as a snack or a garnish, Oxalis is a tasty edible weed. Oxalis stricta, also known as yellow wood sorrel or lemon clover, is an annual weed that you can find anywhere…and everywhere. It spreads aggressively from its seedpods—which can explode on contact! It only takes a brief sampling of the leaf to figure out why this weed is also called sour grass. The plants are full of oxalic acid, which is dangerous to humans in large amounts, but relatively harmless in small doses. The oxalic acid in the plant gives it a wonderful sour taste that makes for an excellent addition to salads. Oxalis grows commonly in lightly to heavily shaded garden areas. Look for them under plants like hostas. The long, lion-toothed leaves help identify suburban lawn villain Taraxacum officinale, but if you ever have a doubt, look for the aster-esqe yellow blooms. In its long botanical history, the dandelion has been used medicinally, but also as food. Dandelion roots, leaves, and flowers are entirely edible. Roasted, the roots can make for a caffeine-free coffee substitute. The young leaves make for bitter but interesting additions to salads. 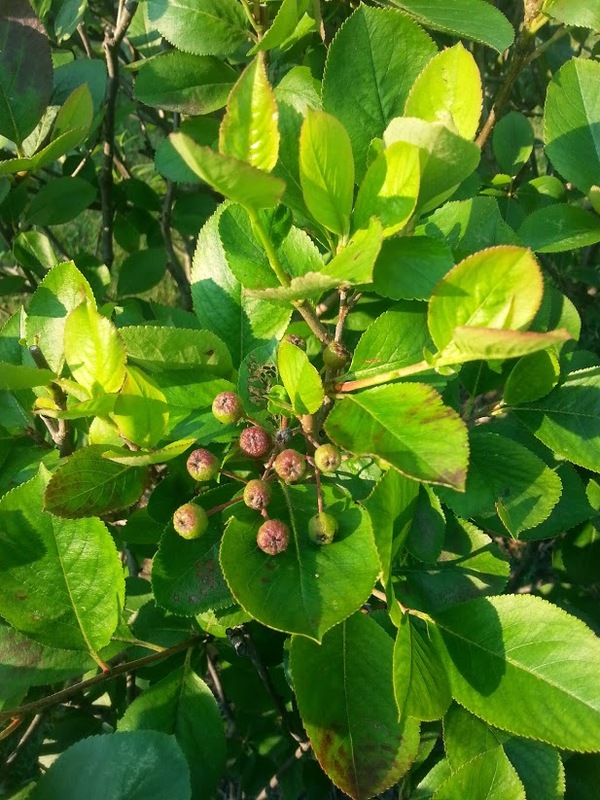 The plants can also be deprived of sunlight until the leaves become pale, which will change the flavor of the leaves to make them more palatable. The flower buds can be fried and eaten, while the open blooms can be used to make dandelion wine! 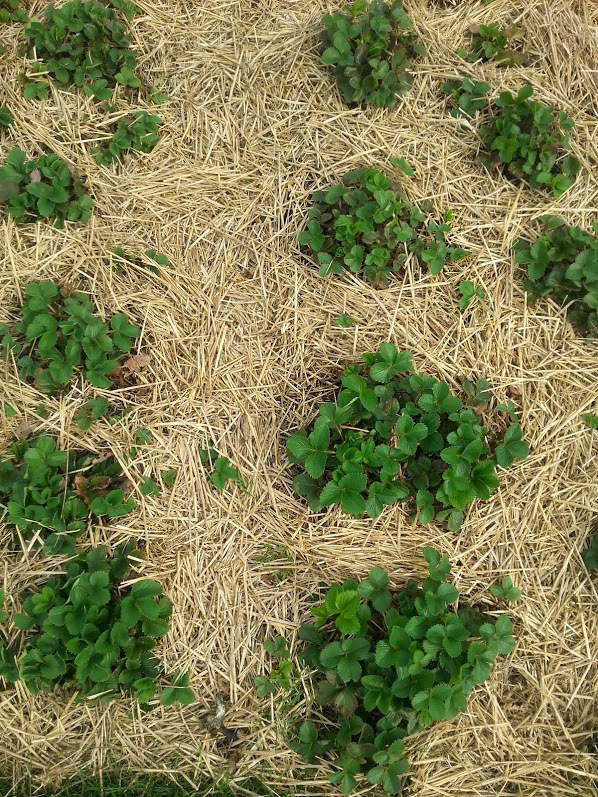 Keep an eye out for the fairly drought resistant Portulaca oleracea in areas where the ground tends to crack. Purslane (Portulaca oleracea) is a weed that you can find in sunny garden areas. 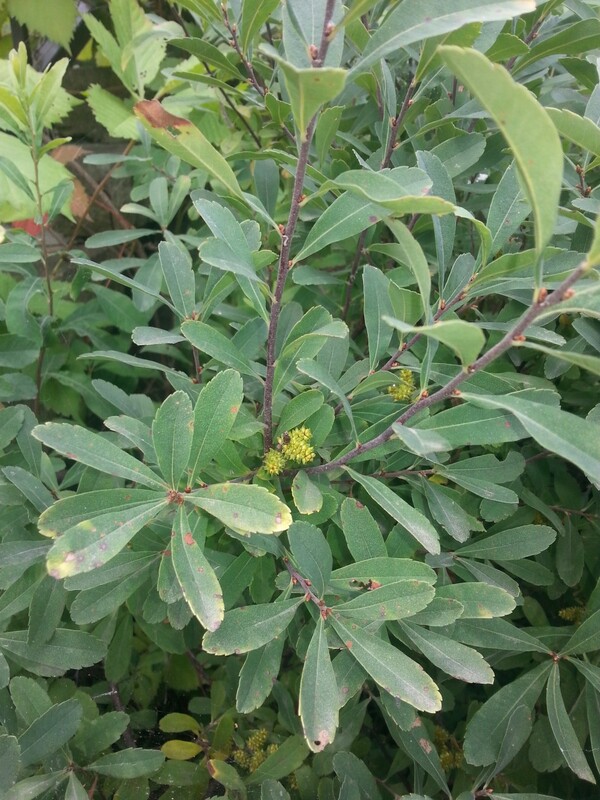 They have succulent, red to green, low-spreading stems with flat, paddle-shaped leaves and bright yellow flowers. Purslane actually has an ornamental relative called moss rose (Portulaca grandiflora), which have leaves that are more pointed than flat, and much larger flowers. Though they are also edible, why bother when you have purslane growing naturally? 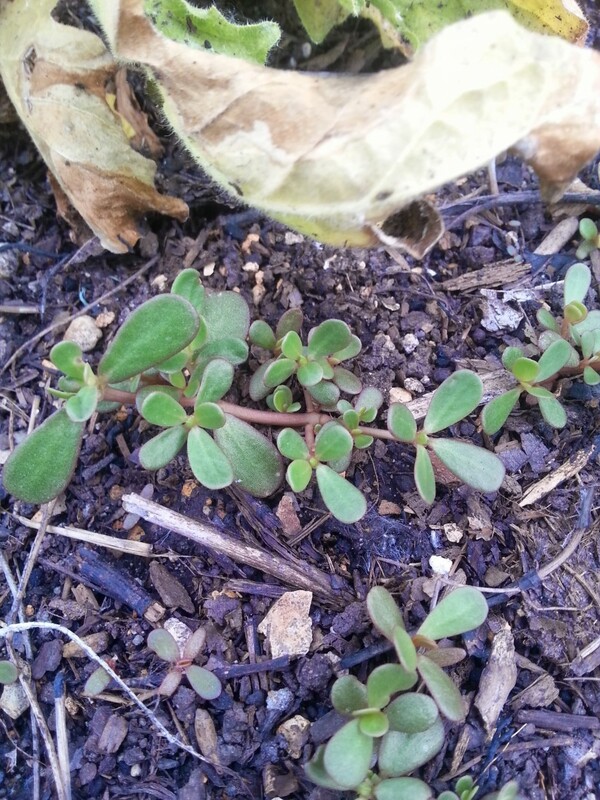 Look for purslane in sunny areas, particularly where the ground can get dry. Harvest purslane any time before the flowers appear, because they can become quite bitter after flowering. Purslane is also incredibly nutritious, rich in Omega-3 fatty acids, and high in Vitamins A, C, and E, as well as magnesium, potassium, and iron, just to name a few. Try it raw, or in a stir-fry! 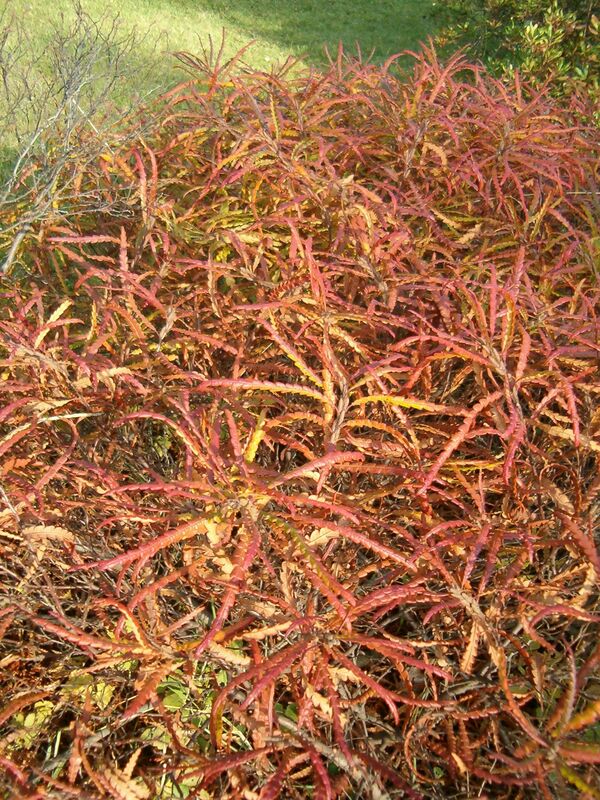 Chenopodium is an easy weed to scarf up while working in the garden. 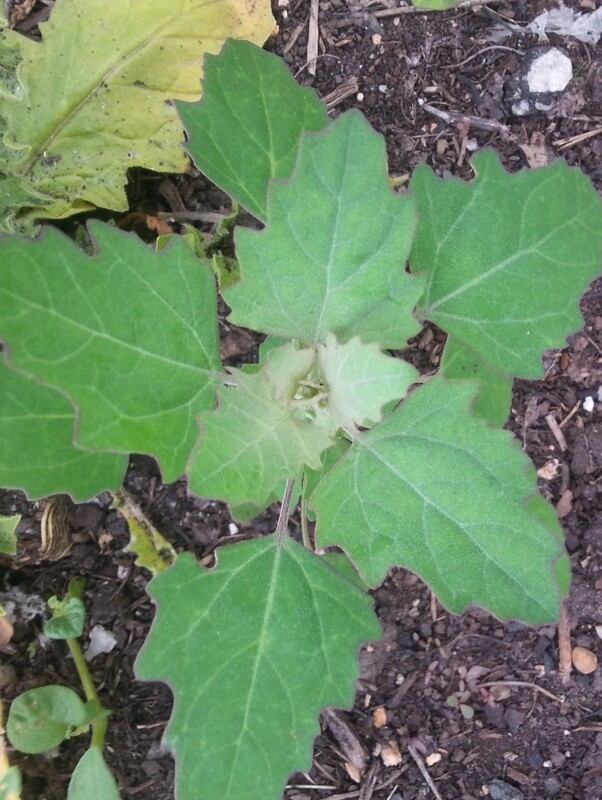 Another common edible weed is Chenopodium album, also called lambs’ quarters, or goosefoot. It will grow in sunny to partly shady areas and is high in Vitamins A and C. Like Oxalis, it also has high amounts of oxalic acid, so remember to enjoy it in moderation. I prefer to eat the young seedlings which only have 2-3 sets of leaves. This makes for an easy snack while you’re in the garden. Steer clear of Chenopodium’s southern cousin, epazote (Chenopodium ambrosioides or Dysphania ambrosioides). 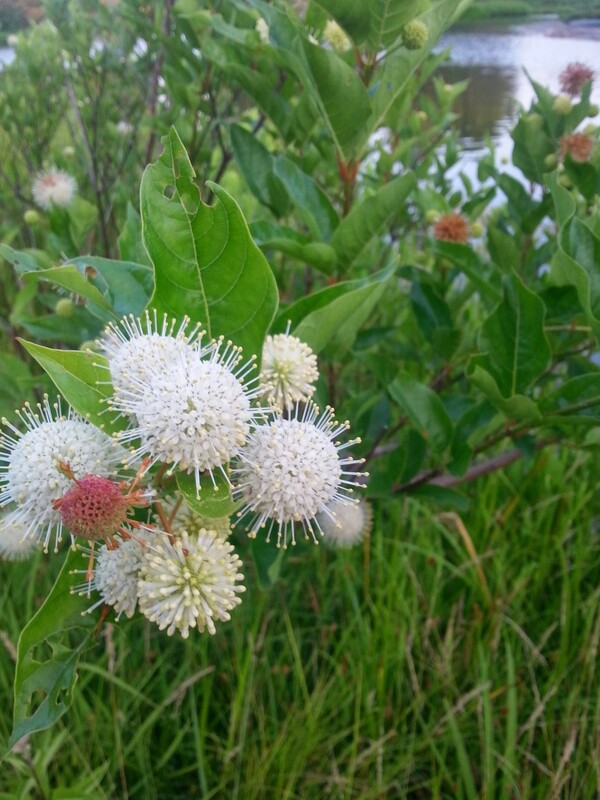 Native to Central America, South America, and southern Mexico, this weed can now be found on roadsides in North America as well. While epazote—whose long skinny leaves do not resemble a goosefoot—is used medicinally for a number of purposes, high doses can can cause severe dermatitis or allergic reactions. 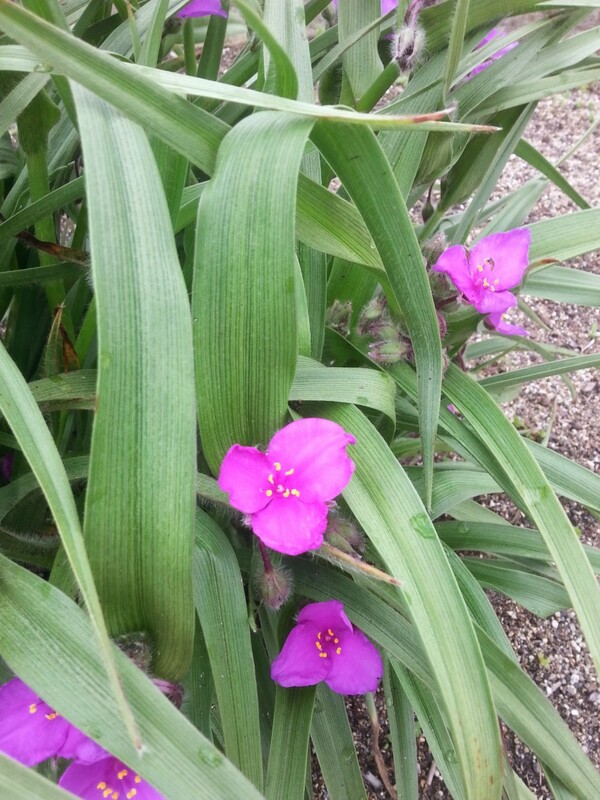 Tradescantia is more of a beautiful garden edible than a weed. As our final edible weed, I debated including Tradescantia, or spiderwort, in this list. Though it can spread in the garden, it is not anywhere as aggressive as the other weeds in this list. It is also commonly grown for ornamental purposes. In fact, I’m planning to order some of Chicagoland Grows’ Tradescantia ‘Tough Love’ —a reddish-purple-flowered cultivar—for my garden next year when it is released! 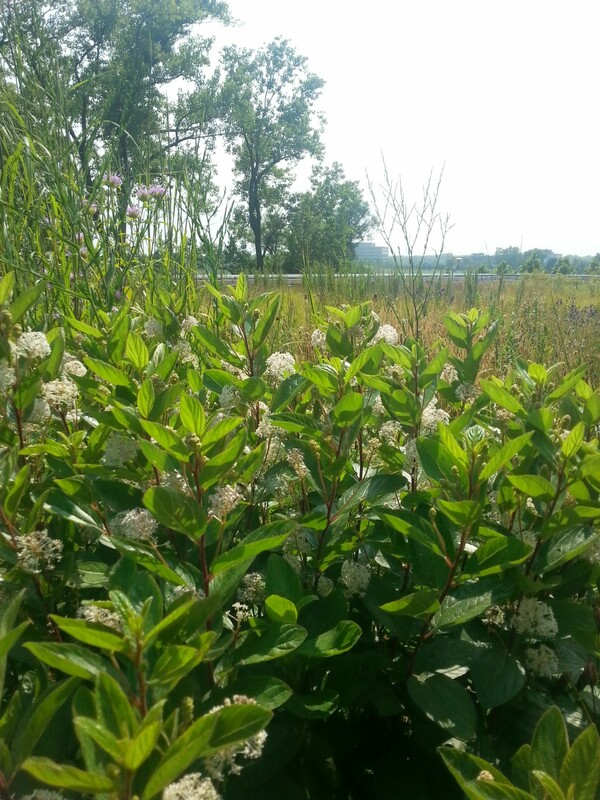 The wild plants vary a great deal in size from 1 foot to 4-5 feet tall, depending on species. The small, three-petaled flowers are often blue, but also come in purple, pink, and white. The name spiderwort may come from the fuzzy, webbing-like stamens of the flower, or from the way the mucilaginous substance in the stems will form thin, web-like strands when broken. If you’re planning on eating this one, peel the leaves off the stem and cook them like asparagus. You can also chop up the stems (or leaves) and fry them. But don’t stop there—the flowers are also tasty when raw. Since they usually last for just one day, you don’t have to feel guilty about eating them either! Plus, since they’re native plants used to grazing animals, they can take the abuse! 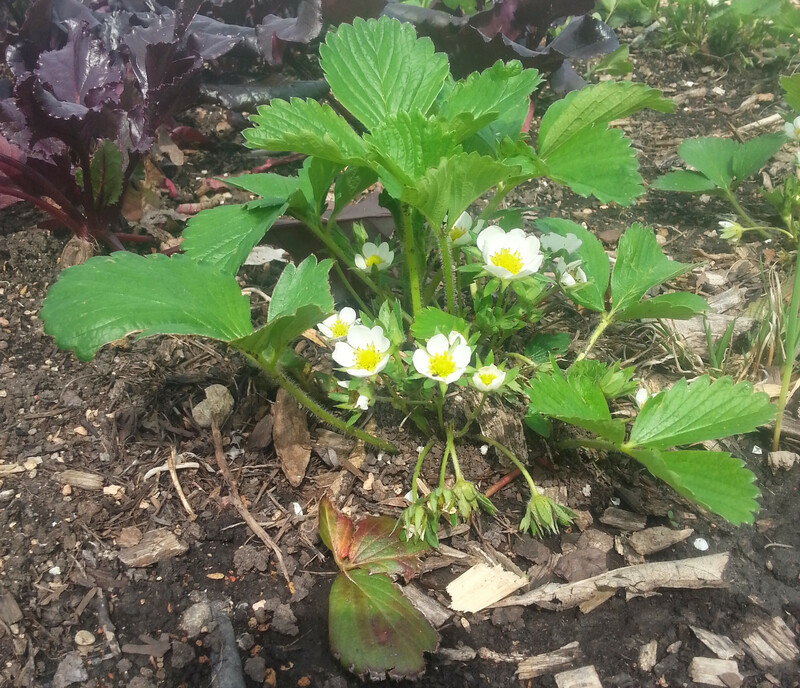 Interested in learning about more weedy cuisine in your yard? Join environmentalist, author, and forager Melany Vorass Herrera for The Front Yard Forager Workshop on Friday, June 20, from 6 to 8 p.m.